After a humiliating command performance at Lincoln Center, the Barden Bellas enter an international competition that no American group has ever won in order to regain their status and right to perform. THE REVIEW: The first Pitch Perfect took many people by surprise including myself. I did not expect such an entertaining film and even called it the funniest film from 2012 after I saw it. The music, the characters, and the humor were all top-notch and combined for an all-around quality film. Pitch Perfect 2 carries over many of the same ideas and basic template, but still manages to produce a lot of laughs along the way. But while the sequel is just as funny and entertaining as the original — in some regards, the bigger musical set-pieces trump what you saw/heard in the first — Pitch Perfect 2 also loses some of the charm along the way. Part of the reason I think the first film was so successful is that the world of a cappella was mostly unseen in the world of film and the novelty of the Barden Bellas was interesting to watch. 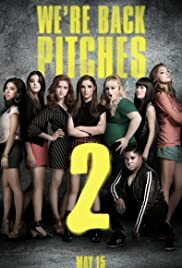 Old characters like Fat Amy (Rebel Wilson) and newcomers like Emily Junk (Haliee Steinfeld) do give the film a unique chemistry, but instead of discovering who the Bellas are, Pitch Perfect 2 is more about moving on. This may sound incorrect, especially if you’ve seen the film, but I think it’s quite apt. One of the plot points in the film is the Barden Bellas going to a retreat run by former leader Aubrey (Anna Camp) in order to find their voice. And yes, part of Pitch Perfect 2 is a return-to-basics “who are we” type of story, but much less so than the first. In Pitch Perfect, Beca (Anna Kendrick) helps define the voice which rockets the Bellas into the national championships. Defining a group and seeing an origin story is almost always entertaining (no wonder why all the superhero films seem to go this route). Soul-searching and going back to your roots can also succeed, but in the case of this film, it doesn’t feel sincere. Instead of doing it as a means to reconnect the Bellas, it’s more of a stop-gap measure to win the world championships before everyone graduates. One of the criticisms I heard most about this sequel is that the story was all over the place. Countless plots and subplots all mashed together, often in ways that feel disconnected. This sort of episodic approach of jumping from scene-to-scene didn’t really bother me as much as it lacking a clear direction. The bookends of the film are the Bellas losing their status as reigning champs due to Fat Amy’s incident performing in front of the President and performing at the world championships to regain their title. Those are solid. The arc in between, not so much. THE TAKEAWAY: I still chalk this up to a worthwhile comedy that delivers on many fronts. It may not have the originality of the first film or a more rewarding quest/purpose for going on the Bellas’ journey, but Pitch Perfect 2 packs in a whole lot of laughs and great singing in two hours.